But before Central Parkway could be constructed, the subway tunnels had to be built. And before the tunnels could be built, the canal had to be drained. And once drained, workers faced the daunting task of clearing the debris that was exposed. Since 1845, the Miami & Erie Canal had served not only as a means of commercial transportation through Cincinnati to the Ohio River, but also as an impromptu landfill. When drained, the canal revealed an assortment of trash that had been discarded into the stagnant, murky water by residents who assumed it would either float away or sink and never be seen again. Once the debris was cleared, and the subway tunnels were completed, the Parkway construction could begin. This was just one of many unexpected hurdles that would delay the construction of both the subway and Central Parkway on its path to incompletion. As the Miami & Erie Canal was drained, decades of debris hidden beneath the water was slowly revealed. LEFT: The canal bed at the Crosstown Bridge (Brighton Bridge) begins to reveal its contents. May 5, 1921. RIGHT: An assortment of debris, including tin cans, wooden boxes, broken furniture, and wire fencing, is visible. June 17, 1921. LEFT: The view north from the Liberty Street Bridge shows similar debris at the bottom of the canal. April 22, 1920. 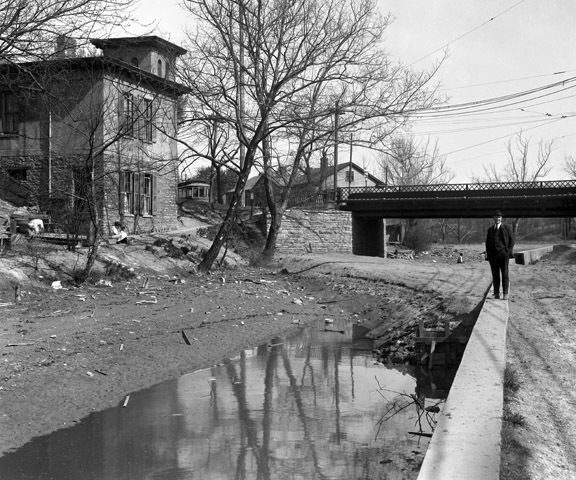 RIGHT: In front of Proctor’s Flats at the Findlay Street Bridge, children play in the empty canal, picking through the rubbish for scraps. June 18, 1920. In 1926, the majority of commuters were expected to utilize the subway for their transportation needs. Conversely, the landscaped Parkway was expected to provide a scenic route for touring motorists travelling through the Over the Rhine district and other neighborhoods bordering the route into the downtown business district. In the downtown area, it would provide a park-like setting for residents living in the grand brownstones to be built, as well as for shoppers and businessmen wanting to relax and take a break from the hustle and bustle of the city’s pace. Completed Central Parkway TOP LEFT: Looking west along Central Parkway from Race Street (YMCA in background, subway ventilation shaft in center tulip bed in foreground), July 2, 1928. BOTTOM LEFT: View today via Google Maps. TOP RIGHT: Looking north along Central Parkway from 12th Street (Music Hall in background) July 6, 1928. BOTTOM RIGHT: View today via Google Maps.